Grab your flashing, glowing, neon gear and join us for our 4th annual Brite Nite 5k! 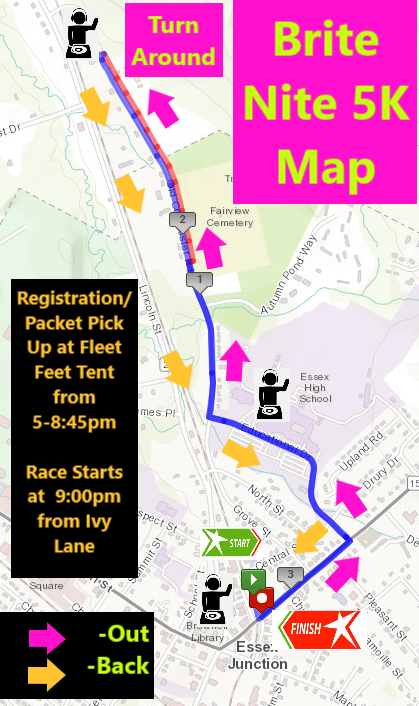 This 3.1 mile out-and-back race starts off Main Street and continues down Educational Drive, turning down Old Colchester Road, with the turn-around at the Tree Farm. Multiple music and light stations set up along the course will keep you energized and having a great time. Awards, prizes, and snacks to follow the race. Register by July 5th to guarantee yourself a t-shirt and glow gear. Due to safety concerns, this race is not suitable for walkers.